What are Night Vision Cameras? Can Night Vision Cameras See Through Glass? What Range do Night Vision Cameras Reach? Do Night Vision Cameras Give off Light? Can I get Night Vision in Colour? In the modern day surveillance and security camera industry, Night Vision features are becoming more and more prominent. You have probably seen “Night Vision” or “Infrared LEDs” labelled onto many systems. But what are night vision cameras and how do they work? Night Vision has been indevelopment since the early 1930s when the German army began design of the first night vision systems. Since then, the technology has come a long way. You might have seen night vision goggles in spy or war movies, giving people the ability to see clearly in even pitch dark! Many animals have special biological features to help them see at night. This might be to avoid danger, or be the danger. Night time and in the dark is dangerous and mysterious to humans too. That is why Night Vision is so necessary for your modern security camera system. So how do they work? The science behind night vision cameras is surprisingly simple! No fancy spy gadgets needed. This is thanks to simple infrared light detection. Now that sounds complicated, but don’t worry it’s really not! Human eyes can only see some types of light, and infrared light is one of the types of light we cannot see. However, a camera can detect this type of light, and can then display the image in black and white onto your monitor screen. The solution then is simple. Cover the area in this “invisible” infrared light which only the camera can see. And this is done by the inbuilt infrared LED lights in your camera. So why are night vision cameras better than normal security cameras? Well for a start, a night vision camera and a non-night vision camera are practically the same price. So you have nothing to lose! For a security camera, most crime happens at night. You will want to be alerted to thieves or home invaders via your security camera especially in the early hours of the morning! Whether you are at home during that time or not, being able to identify a criminal on camera can be a huge help to police in rendering justice. But what if you want your camera for other uses? Perhaps as a baby monitor or just to keep an eye on your children and pets? You will want night vision here to! Night time can be the most crucial time to make sure everything is running smoothly and no one is up to mischief! Many people still have lots of questions about Night Vision technology. And this is understandable, you want the perfect camera after all! So here are some FAQ and answers to assure you that night vision cameras are right for you. The quick answer? Yes! Night vision infrared light can easily go through any transparent material (glass, clear plastic etc). Though there can be some drawbacks if not set up properly. For one, glare and reflection can detract from the image. Also, if the glass or clear plastic gets dirty or scratched, this will drastically decrease visibility. So, yes night vision can see through glass, but make sure you set it up right, for the best possible quality. Night vision range changes from camera to camera. Most low end cameras with night vision will see between 15 to 20 feet in total darkness. However, high end cameras might have LED lights that will be able to illuminate up to 300 feet or more! It all depends on the type of camera. Though, your night vision cameras can have their ranged increased too. 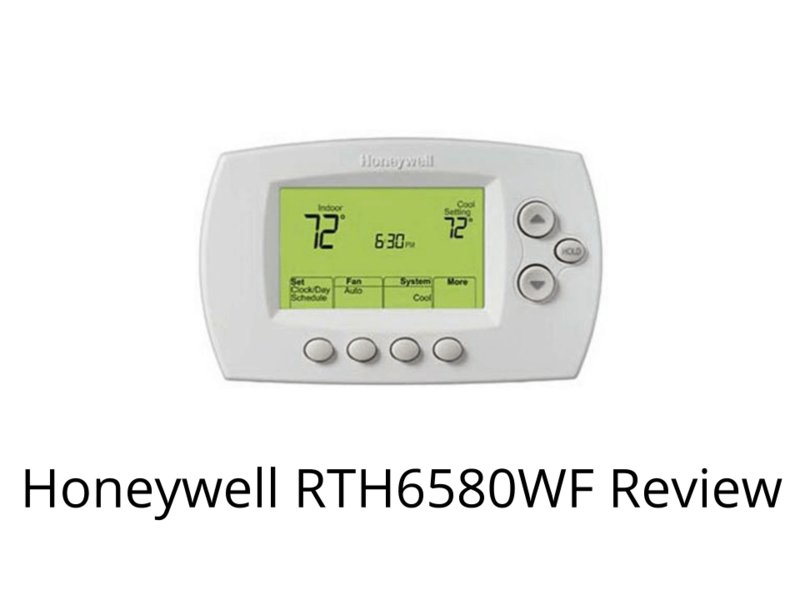 This can be easily done by adding additional infrared LEDs or other lighting. Its a quick and easy fix that is cheap and easy to increase your night vision range. Well yes, infrared light. But no, most of the time you won’t be able to see the light emitted. Though occasionally you might see a red glow around the LEDs, this is normally quite dim and of no concern. Though colour is possible for some night vision cameras, it is a far more advanced technology. This is generally done with more advanced lights than the normal small infrared LEDs. So yes,High-Resolution it is possible to get colour night vision. However, there are far more black and white and green and black colour night vision systems. Black and white night vision is the market standard, while colour is an advanced option. Great night vision is a must. Really, a security camera is useless without the ability to see at night. After all, night time is when you need the camera the most! Luckily, the Nest Indoor camera has a great night vision system inbuilt. It is armed with multiple infrared LED lights, which emit invisible light that only the camera can pick up. This means you can see everything clearly inside a room, even if it’s completely dark. The Nest camera system has the capability to see up to 20 feet (about 6 meters) in complete dark. But with even a little light, it will be able to see much further. When the night vision is on, it displays in black and white to be able to pick up as much detail as possible. Meaning you don’t lose anything from the 1080p HD recording! But the defining feature of this camera is its wireless capabilities. The Nest Indoor is the perfect indoor wireless camera. The signal from the camera to your home router can reach up to 15 feet (4.5 meters) or more. This can be boosted with wifi boosters to get an even further range. The Nest Indoor is set apart from other cameras because of its consistent signal. The 24/7 live streaming and recording is not often interrupted by signal interference, bringing peace of mind. No need to be restarting your router every few hours! What makes this camera really stand out from the rest in this comparison is its ability to connect to Alexa Devices. This system connects with your Alexa device to work on voice activation. Who wouldn’t want that? Voice command makes everything quicker and easier. The Nest Indoor is a slick and elegant camera with multipurpose uses. As well as a security camera, it can be used by people who want to monitor pets or children while away. A wonderful system for anyone looking for wireless indoor cameras. Even in the dark, nothing escapes the keen lens of the YI Home 1080p Surveillance camera. This camera can automatically switch to Night Vision mode as soon as it senses the light is low. Then it lights up the room with 8 infrared LEDs. To human eyes the room is dark, but to the camera everything is visible. Displayed in black and white every detail up to more than 15 feet (4.5 meters) away will be displayed. Have peace of mind that, no matter the time of day or night, you can monitor your home with the YI Home camera. This camera is known for its use as a wonderful indoor camera. It can be used as, not only a security camera, but a pet or baby monitor. Built with motion and baby cry sensors, it will alert you to any noteworthy events seen or heard. Plus its slick design also appeals to indoor use. The YI Home blends in seamlessly to your home decor. Some would assume it’s a feature! With a wonderful indoor mount and non-intrusive appearance it makes for the perfect indoor surveillance system. Besides its full HD recording 24/7, the YI Home also allows for streaming via their app. This app will allow you to watch through the camera any time of the day. It even comes with the ability to share your camera with family and friends. Or you can view multiple cameras through your same account. All footage is stored securely in the cloud storage. No worries about corrupted SD cards, whenever you want to review the days activity it can be downloaded straight from the internet. A wonderful camera suitable for anyone with indoor surveillance needs. Whether that be pet and baby monitor, staff monitoring, or security reasons, this camera works seamlessly. A spy isn’t a spy without night vision goggles. And a spy camera isn’t a spy camera without night vision settings. Luckily, AREBI’s Spy Cam comes with some of the greatest night vision features around as far as high resolution cameras. The resolution can be adjusted between 1080p and 12 megapixels. For its size this Spy Cam’s features are extraordinary! It is built with 6 infrared lights displaying invisible light that only the camera can see. These lights however have a low range of only a few feet of night vision. But this is saving you in power! Additional infrared lights can be added to increase night vision range. The AREBI is the perfect spy cam. It has been built with multiple features that increase its effectiveness. But firstly, its size makes it ten times harder to spot in your home. No intruder or anyone else will be able to see that they are actually on camera. The black colour also makes it impossible to be seen at night, and improves its secrecy during the day. This little spy camera then has a 150 degree view of the area. This increased view makes sure you have recorded everything happening in that room. And the camera can be placed just about anywhere in your home. The camera comes with a magnetic back, allowing any metal surface to act as a mount. And if you don’t have a metal surface, the package comes with a metal plate that can be glued onto almost any surface and act as a mount. The system also is kitted with an alarm and notification system. The settings are adjustable to suit whatever your needs are! The stand out feature of this camera, compared to the others in the comparison, is its ability to charge while recording. The charger cable is able to bend to hold the camera upright. And the camera system itself will continue to charge and operate. For many people who fear something happening whilst their camera is charging, this feature brings great peace of mind. This system is great for anyone who needs a discrete, or secret, camera placed in their home. A perfect system for those who don’t want an intruder to know they are being monitored. Or perhaps as a child monitor it will help you keep an eye on them secretly. Most surveillance and security cameras have night vision that can reach, at best, twenty or thirty feet. But most people want more. And lucky for you, that is what the Amcrest supplies. With over 329 feet (100 meters) of night vision range thanks to it advanced infrared LEDs, you will be able to look over a vast area even in the dead of night. Additional light sources in the area will improve its distance and resolution, which could provide a range even greater than this! The Amcrest 1080p PZT camera really is one of the best cameras for range. Along with its impressive night vision, it is designed as a PZT (Pan, Zoom, Tilt). The camera can zoom up to 25% optically, and then an addition 16% zoom digitally. You won’t miss a single detail even far away. And with 360 degree pan and 90 degree tilt, you will be able to see everything in the area! These are not it’s only impressive features. Some additional stand out features the fact that the camera is completely water and weatherproof. You have the freedom to place it just about anywhere. And the mount fits neatly onto almost all wall surfaces. Everything recorded is stored twice for extra secure storage. Once on the micro SD card inserted into the device, and then also stored into the cloud. It is also easy to stream the footage straight from the cloud to your mobile device. Truly the perfect camera you want for large properties, indoor or outdoor. This one camera will save you so much money too. Because of its PZT, it can cover an area normally covered by four or five cameras! And because of the night vision technology inbuilt, there is no need to spend money on security lights. The Ring Floodlight package has decent night vision, but it is most times unnecessary. Thanks to the motion sensor spotlights, if there is any movement in the cameras range the lights will turn on. This provides more than enough light for the camera to see clearly. In fact, the two flood lights have a combined brightness of 1800 Lumes. That is plenty! The Ring Floodlight package is very special. It combines the use of flood lights and camera into a perfect security system. The light sensor covers a even larger area than the camera. Even if the camera fails to spot an intruder, the lights will alert you. But there is more to it than just that! With two way audio, you will be able to hear and talk to anyone via the camera. To go with this, you will be able to activate a siren when needed. A perfect marriage of security lights and security camera. This camera system also comes with an amazing technological feature that sets it apart from others. You will also know when someone is creeping about thanks to the customisable motion detector software. This software allows you to select which areas you want to be alerted for if there is motion sensed. 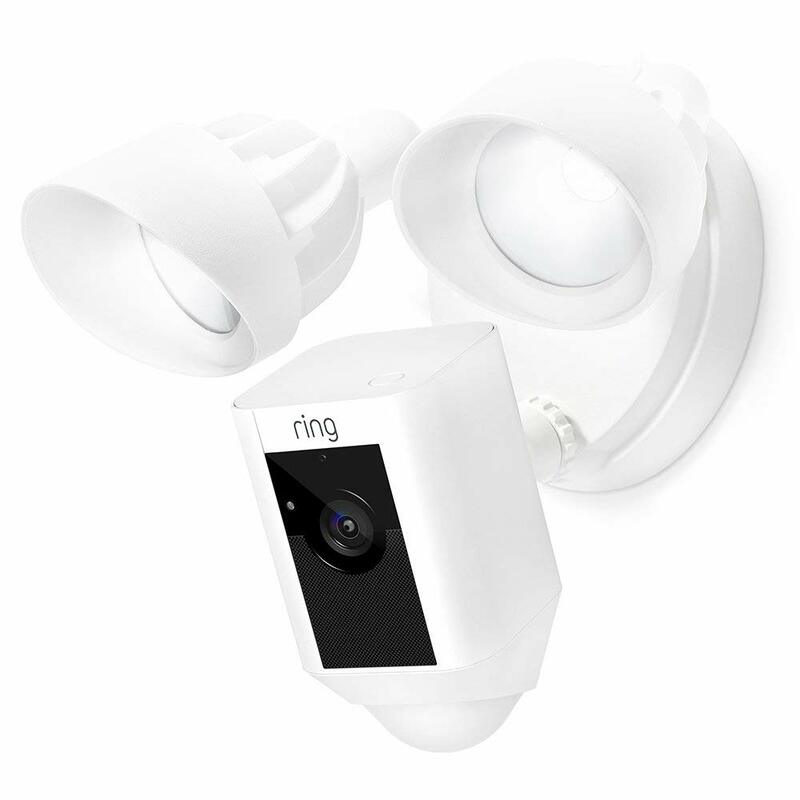 A wonderful system merging security lights and cameras, Ring Floodlight is great for any home security system. With a few units you will be able to cover your entire property. No more need to worry about security or your families well being. You know exactly what is going on around your home. And the flood light is a wonderful deterrent to any criminal. 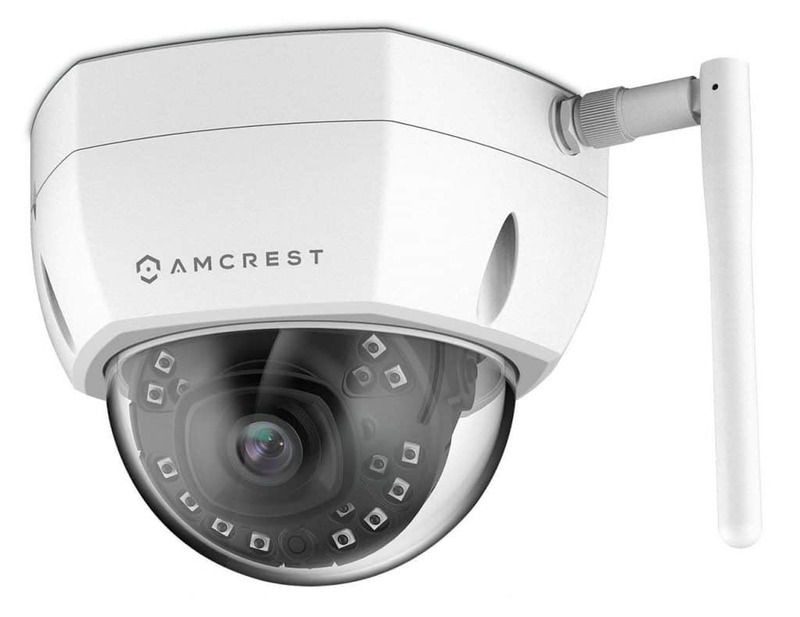 The camera with the second longest night vision range on this list: Amcrest’s Anti Vandal outdoor system. This camera can see up to 98 feet (30 meters) in the complete dark. This is all thanks to its 30 infrared LED lights. That is enough to truly light up the place! In full HD, you won’t have to worry about anything slipping past your view in the dark. Thanks to its shape and solid design, this camera is resistant to most situations. Water and weatherproof, even through storms it has amazingly remained operational. 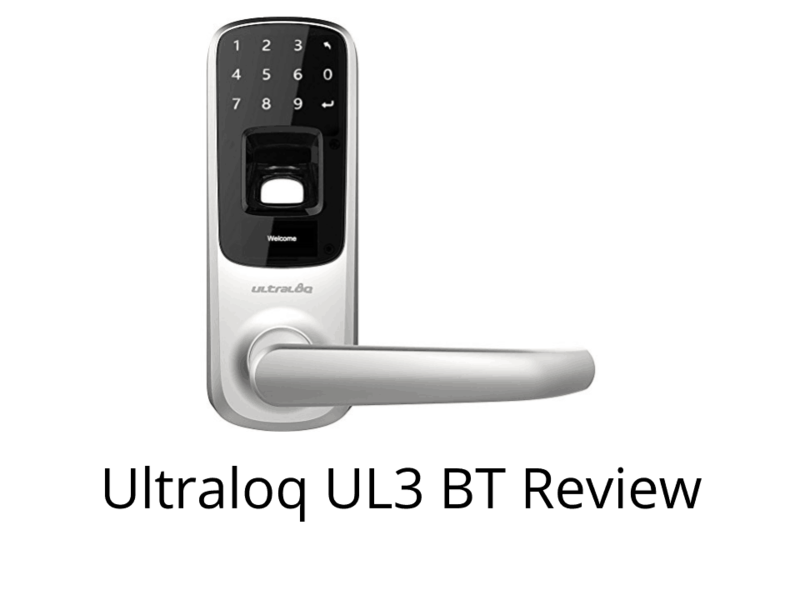 It is mainly designed to be anti vandal proof as well. The shape, the rounded dome, means that it is extremely hard to damage. The camera is always safe behind the case, able to withstand even sudden strong impacts. It would take a lot to take down this camera! The Amcrest Anti Vandal camera is set apart from the other systems on this list by this feature: everything is filmed in high resolution. It films in 4 megapixel (2240 x 1680) which will make sure you can see everything displayed in the greatest detail. Everything is also recorded in 30fps, meaning there are no gaps in the footage. You will see everything as if it were happening in front of you. All data and snapshots are saved several times onto the cloud and on the SD card in the camera. You also have the ability to stream remotely the camera feed. This means that all footage is backup several times and even if the camera SD card is corrupted, the cloud saves everything. This camera really is the perfect camera for any area with high crime and vandalism. Large companies or commercial buildings would also benefit from this system. It provides you with extra strength of your system, making system damage less likely.